Memorial is the number one visitor destination in Hawaii. Millions of people from all over the world come to this majestic setting to see for themselves where World War II began for the United States on December 7, 1941. Located in the middle of the Pacific Ocean, 3, 000 miles from the West Coast of America and 4, 000 miles from Japan, Pearl Harbor serves as a central gathering place for the WWII Valor in the Pacific National Monument, which consists of 9 historic locations in 3 of the westernmost United States - California, Alaska, and Hawaii. Of these, five are located within Pearl Harbor itself: the USS Arizona Memorial, the USS Oklahoma Memorial, the USS Utah Memorial, and parts of Ford Island and Battleship Row. 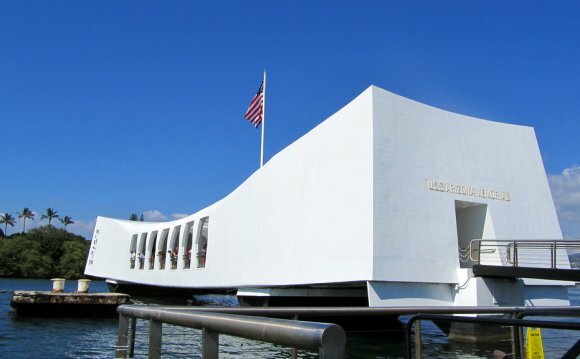 The USS Arizona Memorial is a must-see destination for all individuals coming to Hawaii, drawing more than 1.8 million visitors each year from all over the world. Visitors are free to explore the grounds of the newly renovated million Pearl Harbor Visitor Center. Our new Visitor Center was recently been expanded from the original 3 to 17 acres and is operated by the National Park Service. The Pearl Harbor Visitor Center is open daily from 7am to 5pm (only closed on Thanksgiving, Christmas and New Year's Day). Admission and parking is free to all visitors. Three new parking lots have been built at the Visitor Center and now there is ample parking for everyone!